Send your details to the travel advisors at Mountain Lodges Of Peru for more information about this trip. This Sacred Valley and Lares adventure to Machu Picchu is a five or seven day lodge-to-lodge journey through the rich history, living culture and magnificent landscape of Cusco and the Sacred Valley of the Incas. Four nights in deluxe mountain lodges. Easy-going hikes on uncrowded trails through stunning landscapes. 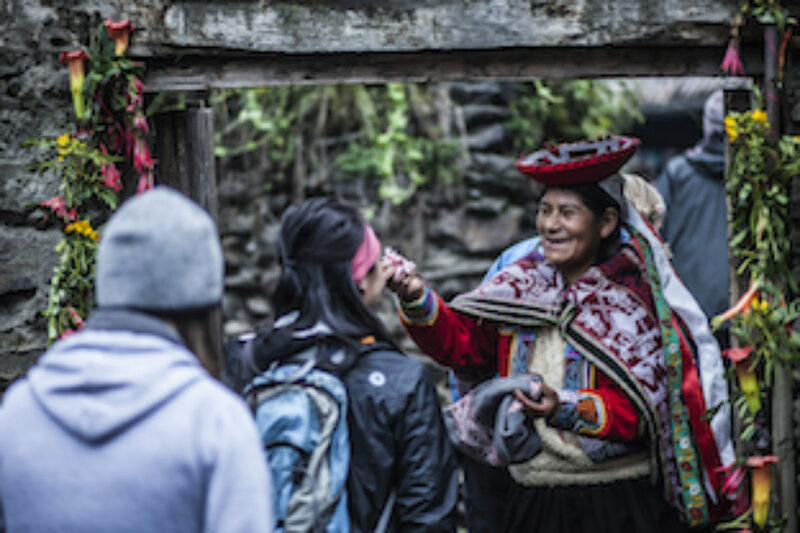 Visit Andean communities and learn about their ancient traditions. Finish at Machu Picchu for a guided tour of the ruins. Your guide and private driver will collect you from your Cusco hotel for the drive into the Sacred Valley, towards the ancient market town of Pisaq. Spend some time exploring the town and its famous market, with colourful stalls of cloth, Andean produce and handicrafts, before continuing the drive to the quieter and more remote community of Viacha. Here you'll learn about the region's unique agricultural history, and how the Inca used their intricate terraces to feed an entire empire. For lunch you'll enjoy a Pachamanca – a traditional meal cooked under hot stones. In the afternoon you'll enjoy a guided excursion of the archeological complex above Pisaq, a wonderful opportunity to explore the complex free of crowds, with the sun setting behind the peaks. Finally you'll arrive at Lamay Lodge to enjoy a delicious evening meal and relax in the comfort of this deluxe mountain lodge – complete with soft beds and a large jacuzzi. Today you'll go deeper into the Lares region, starting with road journey into the mountains for a guided tour of the archaeological site of Ancasmarca, and the ancient weaver's village of Choquecancha. After lunch you'll have the choice of either a scenic drive or a moderate hike past turquoise lakes and towering peaks to the remote village of Huacahuasi to unwind in the comfort of your lodge. Spend some time in the morning learning more about the heritage and day-to-day activities of the Huacahuasi community. 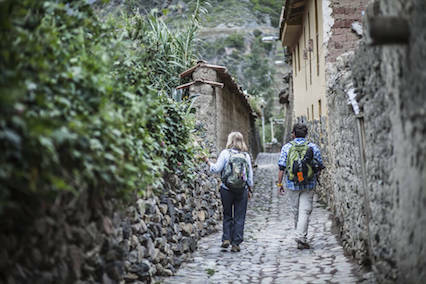 Then, you can choose to embark on a spectacular hike through varied terrain and over a high pass, to the adjacent valley leading to the ancient town of Ollantaytambo, the oldest living city in Latin America; or try an easygoing hike from Lares Pass - along an authentic Inca trail- through a beautiful canyon down to the Local Community of Totora. Or, if you prefer to see more of the Sacred Valley, you can drive back for a visit to an ethnographic museum featuring the history of Peru’s rich civilisations of the past or choose to explore the valley on mountain bike. Afterwards, enjoy lunch in the Urubamba River countryside on your way to Ollantaytambo, where you can spend time meandering through the village's charming maze-like streets. Enjoy an early morning short hike to the Inca ruins high above Ollantaytambo for magnificent views of the town and the temple. Afterwards, enjoy a guided tour of the fortress, one of the best examples of Inca architecture and revel in its mystical history – a perfect introduction to the wonder of Machu Picchu. That afternoon you'll embark on a scenic train ride along the Urubamba River Valley to Machu Picchu Pueblo (Aguas Calientes), a bustling town below the ruins of Machu Picchu. 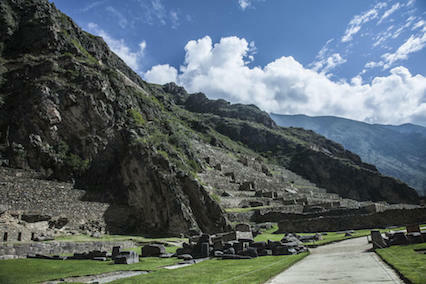 You'll begin your visit to Machu Picchu at dawn with a bus ride up the mountainside to the ruins themselves. As you enter the Sanctuary, the morning sun rises over the iconic Sun Gate and washes the structures and terraces with resplendent light. Prepare to be awed by the skilful architecture of the Watchtower, the Temple of the Sun, and the royal Inca residences, among many others. Take a moment to quietly sit and listen to the wind, or to meditate and absorb the mystical energy that envelops you. 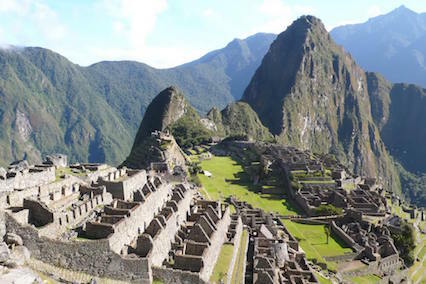 Let your imagination soar as you contemplate the history of Machu Picchu and its mysterious origins. Enjoy an optional onward hike to Huayna Picchu for a different perspective of the ruins, before heading back to Aguas Calientes for lunch and the evening train journey and transfer back to your Cusco hotel. If you want to experience Peru, this is the way to do it! We were a group of 8 couples who chose the Lares Adventure and it was incredible. We honestly can't stop talking about it what a fantastic holiday it was! All transfers and transport, from pick up in Cusco on day one to drop-off in Cusco on day seven, including train to/from Machu Picchu. Four nights in luxurious mountain lodges, constructed from traditional materials and techniques and complete with hot showers, goose-down bedding, jacuzzis and fine dining. All meals (excluding breakfast on the first day and dinner on the last day.) Each lodge offers a fine-dining menu based on the region's traditional dishes, with locally sourced ingredients. Qualified, bilingual trekking guide with deep expertise in the nature, history and topography of the area. Private drivers for all road journeys and transfers. Travel insurance is required, but not included.